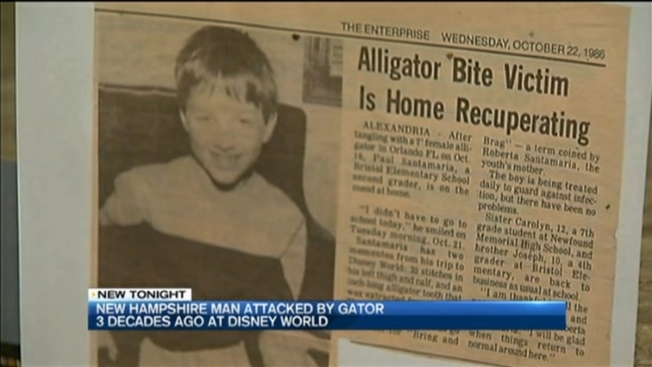 The death of a 2-year-old boy at a Walt Disney World resort in an alligator attack has brought back some frightening memories for a New Hampshire man who was grabbed by a gator at a Disney campground in 1986, when he was 8. Paul Santamaria, of Hebron, said he was horrified for the family of Lane Graves, who was snatched by an alligator in shallow water Tuesday at a beach at Disney's Grand Floridian resort, 3 miles from where Santamaria was attacked. "I have two little girls the age of the boy that was taken, and it was just something that kind of hit home," Santamaria said. In 1986, Santamaria's family was staying at Disney's Fort Wilderness Resort and Campground when he was attacked while feeding ducks at a pond. The gator knocked him down, grabbed his leg and started to thrash around and try to pull him into the water, Santamaria said. An expert on alligators says that while the death of a 2-year-old boy in Orlando, Florida, is extremely unfortunate, the danger of the reptiles is a part of nature. He yelled for help. His 12-year-old sister grabbed him under the arms, and his 10-year-old brother started hitting the gator. Santamaria kicked the gator with his other leg. "Instead of just freezing, they decided to fight, to help me to fight to get away, and I'm here because of it," he said. "I was lucky." Eventually the alligator opened its mouth and let him go. He suffered gashes and a tooth stuck in his thigh, and he was hospitalized for a week. He still has the scars on his leg. The alligator that attacked Santamaria was later shot and killed. A Disney spokesman said then that as far as he knew, it was the first such attack at the sprawling theme park. 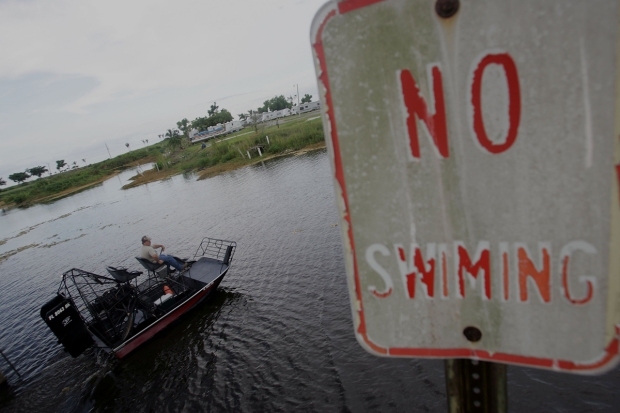 In Lane's case, five alligators were killed in the search for his body, but authorities have yet to determine which of them, if any, was responsible for the boy's death. The Orange County sheriff said it was the first time an alligator had killed someone at Disney in its 45 years of operations. Santamaria has been back to Disney World since he was attacked, but he said he's been much more cautious.